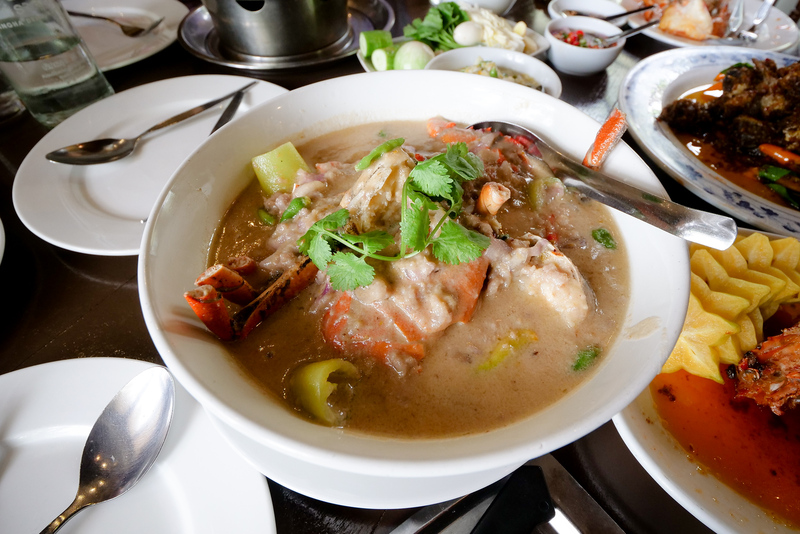 Ruean Panya (ร้านเรือนปั้นหยา) is a Thai seafood restaurant that received 1 Star by the Michelin Guide in Thailand. “It’s a hidden gem,” they mentioned, and so I was very curious to eat there. In this post I’m going to share all the seafood dishes, and a full review about eating at Ruean Panya (ร้านเรือนปั้นหยา). I’m based in Bangkok, I love to eat, and I blog about Thai food. So I keep up on restaurants and follow restaurants quite closely. By no means have I eaten at all the Michelin star restaurants in Bangkok, but at least I had heard of them, or known of most restaurants. But there was one restaurant on the list in the Thailand Michelin Guide 2019, Ruean Panya (ร้านเรือนปั้นหยา), that I had never heard of. So I was very curious to check it out and try the food. Known mostly for seafood, the restaurant is outside of Bangkok in Samut Sakhon, about an hour drive from the center of Bangkok. My wife and I called ahead, just the day before, to make a lunch reservation. 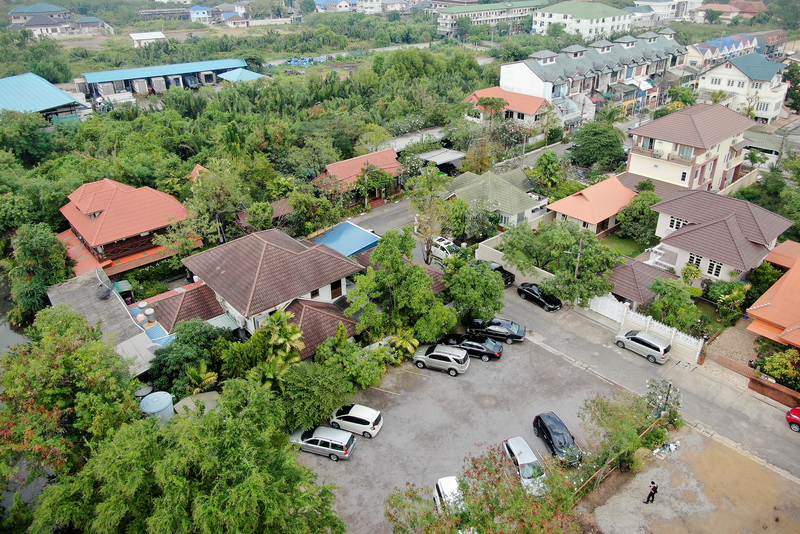 You drive into a small residential neighborhood in Samut Sakhon, and you get to a dead end, where the restaurant is spread out over a series of homes and gardens. Some of the buildings are newer and more modern renovated, and some are more traditional Thai wooden homes. 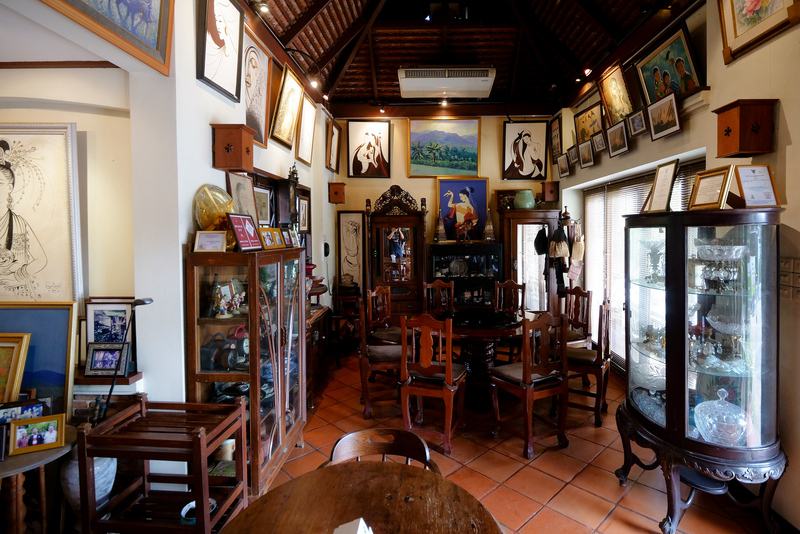 The dining rooms are a museum as well, full of antiques and artwork. Immediately you feel relaxed – like you’re in a family home where you can be yourself. 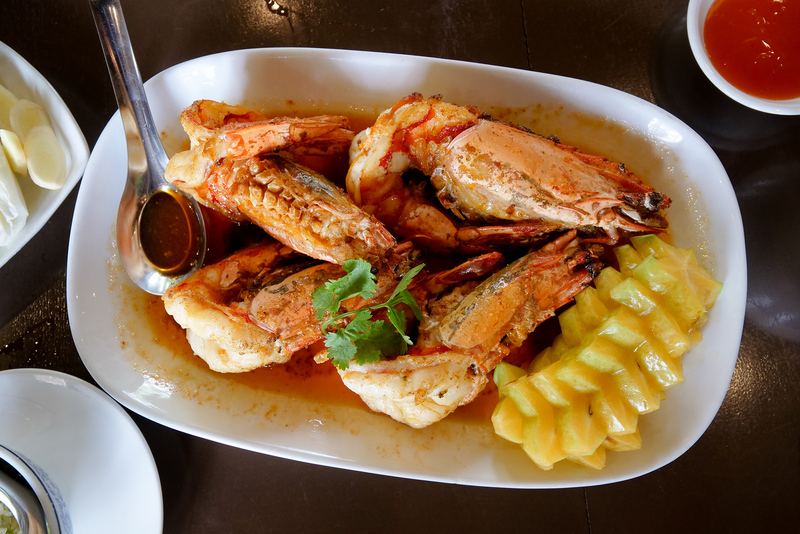 The two main Thai seafood dishes recommend in the Michelin Guide are the shrimp fried with salt (กุ้งทอดเกลือ) and the traditional crab relish (หลนปูเนื้อ). I ordered both of those dishes, plus a few dishes off their speciality menu. 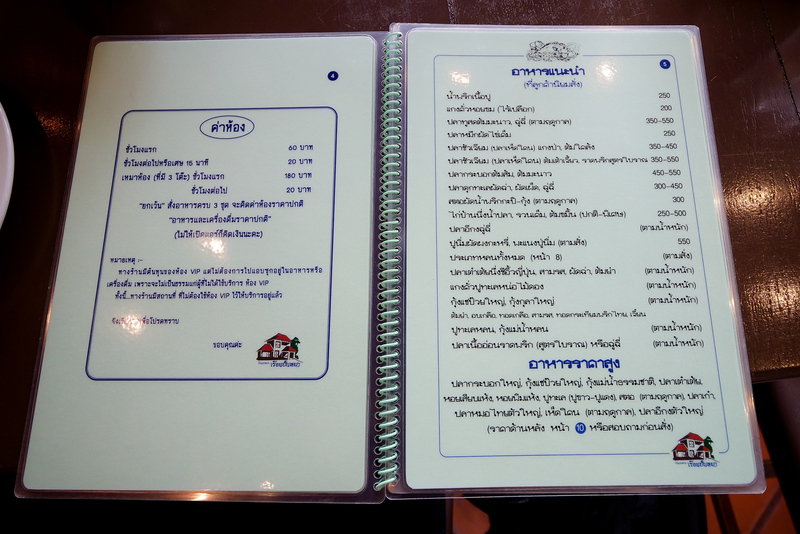 As far as I saw, the menu is only in Thai. Ok, let’s move into the amazing food. One of the signature dishes at Ruean Panya (ร้านเรือนปั้นหยา) is their saltwater shrimp fried with salt (กุ้งทอดเกลือ goong tod kleua). When I ordered it, our waitress asked if I wanted one shrimp per person – and despite being a little puzzled, I said yes – just one shrimp per person? 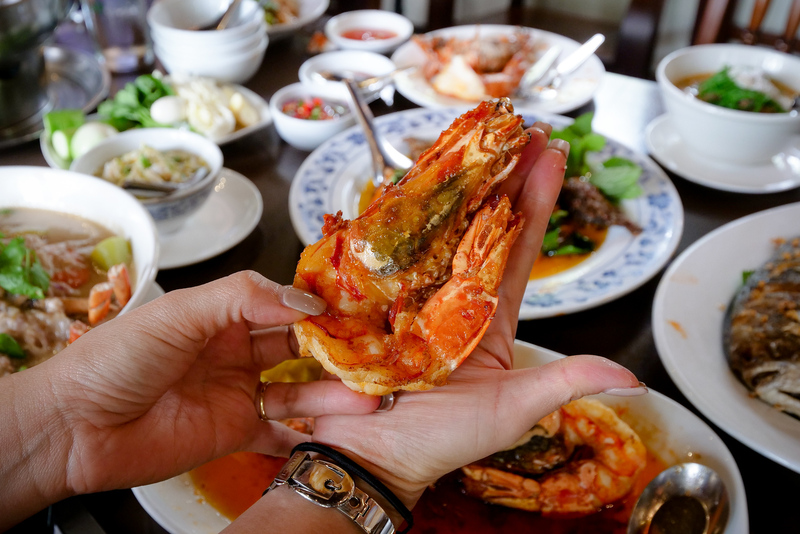 My jaw fell to the table as I saw the fried shrimp for the first time, they were some of the biggest I’ve ever seen – I think about the same size as the legendary tiger shrimp in Portugal. The shrimp in the picture above was one of the smaller ones (if you want to see the hugest one, you’ve got to stay tuned for the video). But really, they were all massive, absolutely gigantic. The shrimp were fried, and served in orange oil at the bottom of the plate, and sprinkled with salt. They were unbelievably firm and naturally sweet, and contrasted by a crispiness from being fried and a complementing sprinkle of sea-salt. I’m a huge lover of all things shrimp and living in Thailand I’ve eaten some shrimp, but these were among the best I’ve ever seen or eaten. It’s a dish like this, the quality of the seafood and the cooking technique, that I’m certain contributed to them getting a Michelin Star in Thailand. I saw this on the menu, and since it was a fish in Thailand I hadn’t heard of before, I wanted to try it. 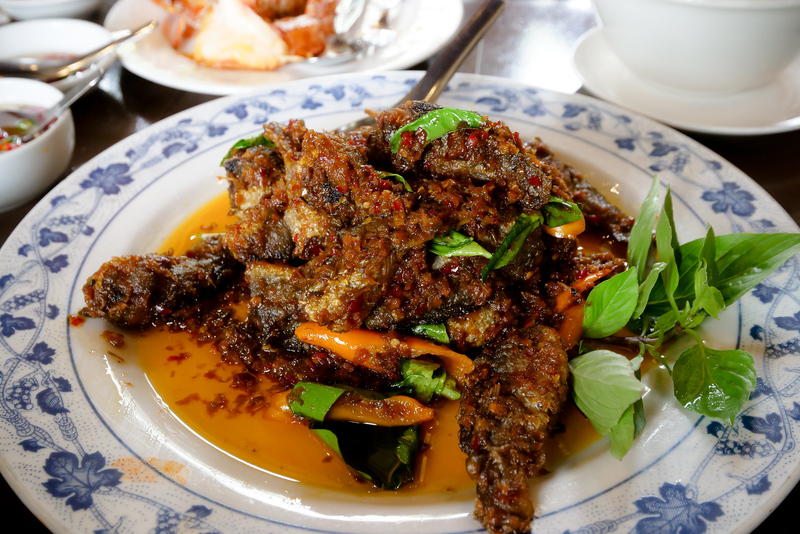 The dish: long-whiskered catfish topped with traditional style chili glaze (ปลาอีกงราดพริดสูตรโบราณ pla ee-kang rad prik sood boran). The fish, which turned out to be a type of catfish, were small, about the size of sardines. They were deep fried first, then fried again with an oily sweet chili sauce. It wasn’t nearly as sweet at typical rad prik (ราดพริด) in Thailand can be, and despite its chili filled appearance, it wasn’t really that spicy of a dish (which is normal for this dish). But it was pretty tasty – the fish themselves were both juicy and crunchy and filled with the chili sauce. The sauce was pleasantly sweet and salty, and I enjoyed the strong citrus kaffir lime taste. One of my all-time favorite fish to eat is pomfret, and I’m a huge fish lover, so I was very excited for this. 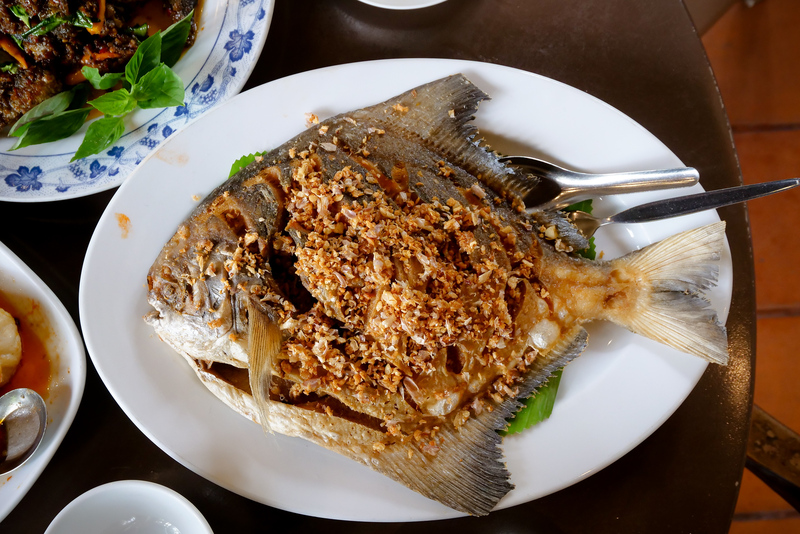 We ordered the black pomfret deep fried with garlic (ปลาเต๋าเต้ยทอดกระเทียม pla dao doy tod kratiam), and I really had no clue how big it would be. 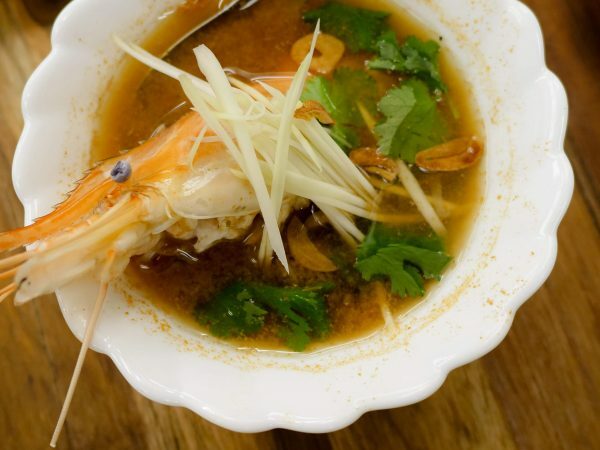 Just like the massive shrimp, this is another dish that will make your jaw drop. The pomfret filled the entire plate, and it was deep fried perfectly golden with a layer of crispy garlic on top. The top crust was so incredibly crispy and remained crispy for the entire meal, while the inside flesh was so soft and silky. It was one of the best fried fish I’ve had in Thailand ever. Next dish we tried was freshwater snail curry (แกงคั่วหอยขม gaeng khua hoy kom). The snails were de-shelled, cooked in the coconut milk based curry sauce with coconut shoots I believe, then topped with blanched cha-om (climbing wattle), and a dose of thick coconut cream on top. This curry was ok, but nothing standout to me. Possibly because I typically associate this type of curry (gaeng khua แกงคั่ว) as being much more spicy and flavor packed, and this one was a little bland for me. It was ok, but I probably wouldn’t order it next time. 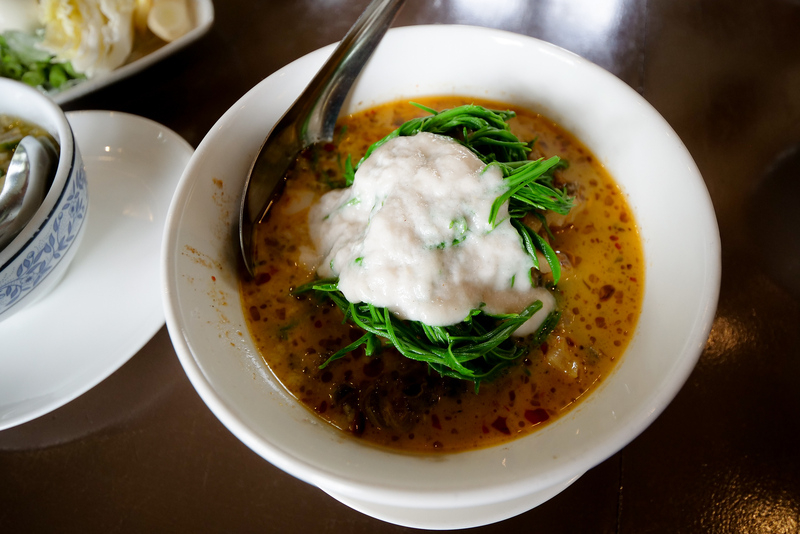 Another dish mentioned on the Michelin Star guide was their crab relish (หลนปูเนื้อ lohn boo), a traditional coconut milk based relish or dip made with mud crab. 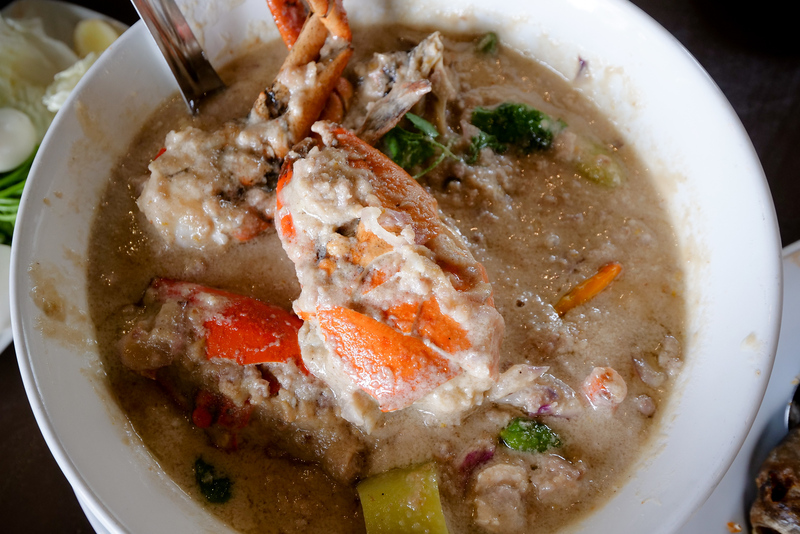 I can tell you for sure that it was the biggest bowl of crab relish (หลนปูเนื้อ) I’ve ever seen in Thailand – an entire serving bowl filled with thick – almost melted cheese looking – coconut cream, and an entire huge orange mud crab. 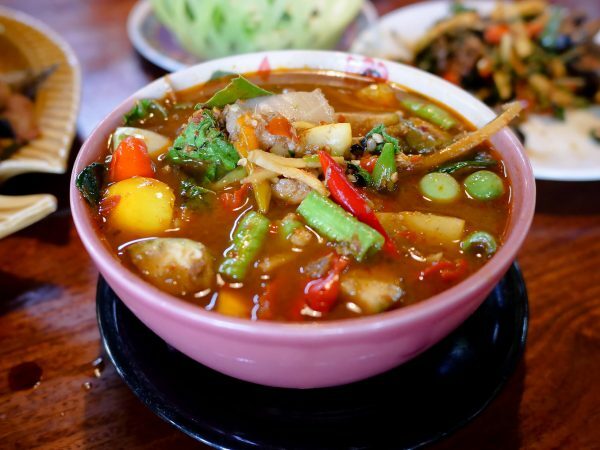 I’ll admit it from the start: any type of Thai lohn (หลน) is typically not my absolutely personal favorite, because it’s a sweeter Thai dish. However, this was one of the best I’ve ever had, and despite being sweet, it was balanced, and I did enjoy it. My wife, being a lover of lohn (หลน) said this is the best she’s ever had. 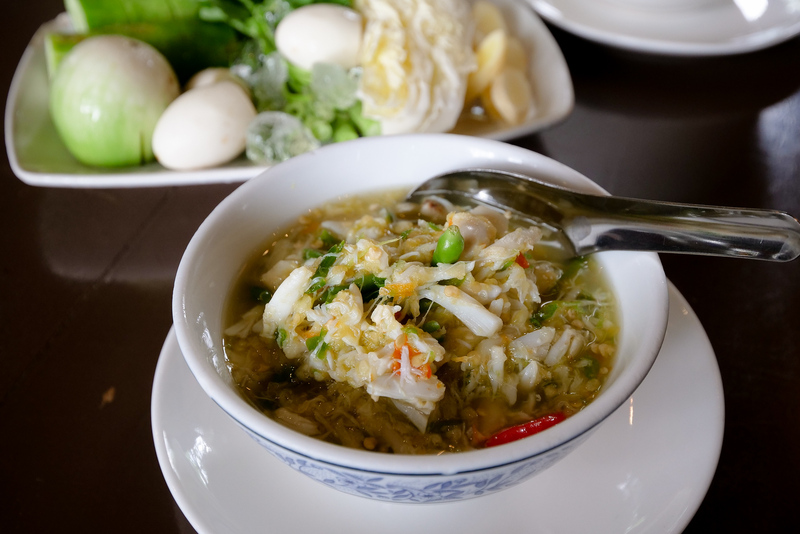 For this crab relish (หลนปูเนื้อ lohn boo), you can either eat it with raw vegetables, or just put it on your rice. I could taste the shallots, the sweetness of the palm sugar, and the thick creaminess of the coconut. The crab was amazing like all the other seafood – so fresh, huge, and incredibly juicy. It’s definitely a must-order at Ruean Panya (ร้านเรือนปั้นหยา) restaurant if you love Thai lohn (หลน). Next for the crab chili dip (น้ำพริกเนื้อปู nam prik neua boo), a chili dip made with strands of de-shelled crab, chilies and garlic, in a mildly sour lime juice and fish sauce dressing. This was another extreme treat and a dish that I loved. Like most Thai nam prik, this was again meant to be eaten with either fresh raw vegetables, or on top of your rice. The crab was so sweet and silky, the chilies were fragrant, and the dressing was just lightly sour, and tasted like a balance of both salt and fish sauce – not too much fish sauce to make it fishy. It’s one of the best veggies and dip you could ever have. I loved it. Finally, I didn’t even realize – but my wife ordered a few non-seafood dishes like fried pork with fish sauce (หมูทอดน้ำปลา moo tod nam pla). 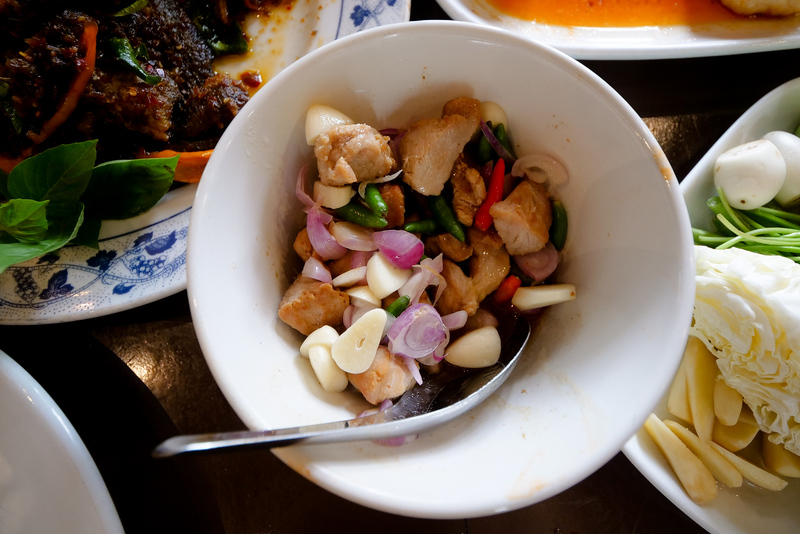 What I did like was that the fried pork included plenty of chilies and raw garlic and shallots. But other than that, it was tasty from the fish sauce, but nothing to rave about like the seafood. I think when you eat at Ruean Panya (ร้านเรือนปั้นหยา), you’ll want to go for straight for the giant seafood as that’s what they do best. 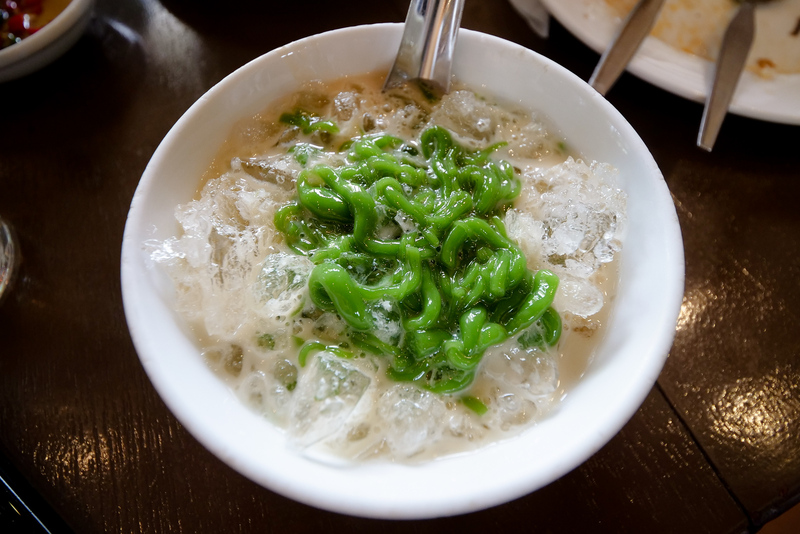 Finally we ordered a popular Thai dessert of pandan rice noodles in sweet coconut milk with ice (ลอดช่องน้ำกะทิ lod chong nam kati). 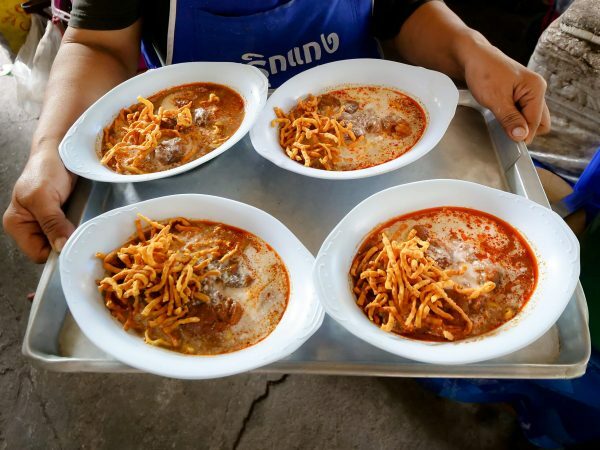 Samut Sakhon is known for being one of the best places in Thailand to eat this dessert. The noodles were nicely flavored with pandan, which to me has an essence of a taste that can be compared to vanilla, but more green tasting. The noodles just sort of dissolved as I took a bite, wrapped up in sweet coconut milk, and crunchy ice. It was very good, and a perfect way to end a giant and incredibly memorable Thai seafood meat at the 1 Michelin star restaurant Ruean Panya (ร้านเรือนปั้นหยา). 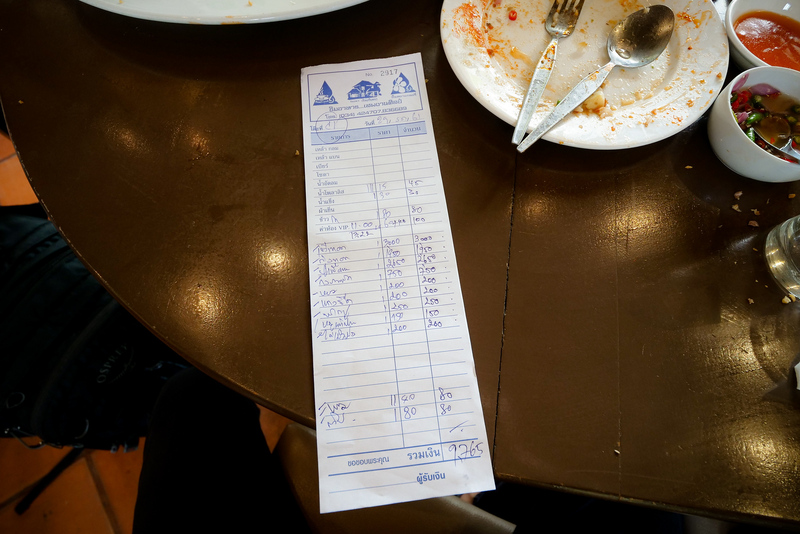 Our total bill came to 9,765 THB ($298.74). There were four adults and one child eating, and there were about 2 – 3 other dishes we ordered that I didn’t mention in this post – smaller non-seafood dishes that my son mostly ate. The black pomfret alone cost 3,000 THB ($91.78) and the crab 2,650 THB ($81.07). So a few big dishes were the bulk of the price tag. For the amount of food we ordered it could have fed 3 – 4 more people (I would say 6 – 8 people total), which would really reduce price per person. 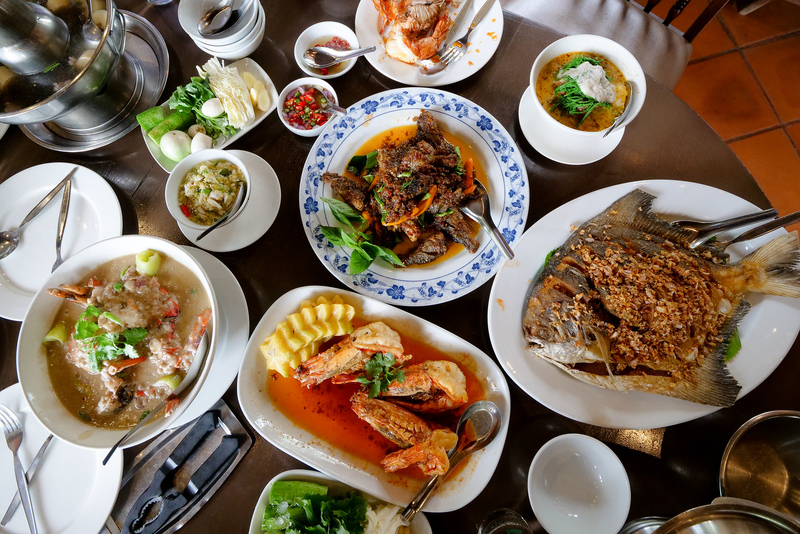 It’s not a set menu or price per person like many of the fine-dining Michelin Star restaurants in Bangkok, but it’s family style – so you can order what you like and share it all together. The ingredients, I’m talking about the seafood, were extraordinary. The shrimp and black pomfret were two of my favorite dishes, and not only were they huge seafood, but extremely well prepared. For myself, Ruean Panya (ร้านเรือนปั้นหยา) exceeded my expectations, and I thought it was well deserving of its Michelin Star. In my experience, this is one of the Michelin Star restaurants in Thailand where you’ll leave stuffed, and very very happy. Other Michelin Star restaurants in Bangkok I really like are Sorn and Paste. 4 comments. I'd love to hear from you! Thank you very much James, greetings to you and your family.